You’ve probably have never heard of the Academy of Machinima Arts & Sciences. Heck, you may not even know what Machinima is, but using real-time graphics engines - most often those found in video games - to create CGI scenes has been a filmmaking technique since 1996’s Diary of a Camper (and probably earlier). United Ranger Films “shot” the entire film using the Quake engine and distributed it widely, though the reception wasn’t very good. Fast forward 7 years to the Internet release of Red vs. Blue’s first episode. Then fast forward one more day. 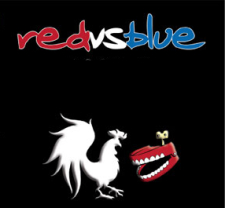 Red vs. Blue had been downloaded by 20,000 people. Within a year, they had garnered Bungie’s blessings and nearly 1,000,000 hits a week. The show itself - for those few of you who haven’t seen it - is a sci-fi comedy set in the world of Bungie’s Halo: Combat Evolved game. However, the writers have taken some...liberties...with their storyline. The series is a total riot and it’ll be funny to you even if you’ve never played the Halo games - and there are plenty of fans out there who aren’t big Halo nerds. Well, way back then I was one of those fans, watching from almost day one. Okay, I got into it around episode 3 or 4 - but still, for a show that ran 100 episodes in length that’s pretty much day one. Red vs. Blue’s creators, Rooster Teeth Productions, have been a long time staple at gaming conventions peddling their wares. I’ve seen them many times selling shirts, DVDs, and pins. However, I was always hesitant to buy the DVDs, because I wasn’t sure if I was willing to shell out for so many seasons. However, Rooster Teeth has a great solution. 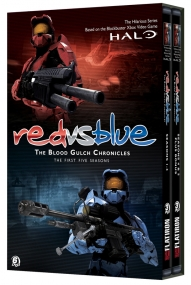 They’ve now released the Red vs Blue: First Five Seasons Remastered Edition Box Set and boy is it loaded with value. It’s got over 250 episodes, videos and extras. The bonus content alone puts any commercial DVD release to shame with alternate endings, PSAs, and documentary footage practically bursting forth. Even cooler is the fact that the early seasons have been remastered and look better than ever. If you’re looking to pick up the DVD, check it out at the RvB web store. It’s about $47, but it’s certainly money well spent. I’m usually the kind of guy who likes to experience everything there is in a game or DVD when reviewing it, but I couldn’t even get through everything on these DVDs, so you’ll certainly have no complaints about lack of content. So grab a copy of the box set of the box canyon chronicles and I’ll see you next year when you’re done watching it all.